The following article is a part of a series of brief country profiles for the EU-27 ahead of the European elections in May. Spain joined the EU in 1986 and has since then subscribed to each EU treaty, including ratifying in a referendum the Constitutional Treaty in 2005. With a population of around 46.5 million people, it is the fourth largest EU country, representing 10.4% of all EU citizens (after Brexit). There are 59 out of the 705 Members of the European Parliament elected in Spain. At the 2014 EP elections, turnout was 43.8%, just above the EU average of 42%. Despite the low participation, 72% of Spaniards consider being part of the EU a good thing (only 6% have a negative view), which makes Spain one of the most ‘Euroenthusiastic’ EU members. This also applies to the single currency, which is considered positive by 81%. Yet, the country is sceptical about overall democracy in the EU, with only 36% positive about it, the second lowest behind Greece. Spain’s economic growth has been robust in the past five years, and this is expected to continue, according to the European Commission’s latest autumn and winter forecasts, despite a recent slowdown. Its total GDP was €1.16 trillion in 2017, corresponding to around 8.9% of the total EU 27 GDP. Between 2014-2018, Spain’s economy grew 2.7% on average annually (real GDP), which is well above the EU average of 2.1%. It is expected to grow by 2.1% in 2019, again more than the EU average of 1.5%. In terms of per capita figures, Spain had a real GDP of €24,500 in 2017, slightly below the EU28 average of €27,700. In purchasing standards (PPS), Spain’s per capita GDP is 92% of the EU28 average. Unemployment remains high at 14.45%, well above the EU28 average of 7% (in 2018), and reaches 34% of the youth population, more than double of the EU28 average. Spain transitioned towards democracy following dictator Franco’s death in 1975, confirmed by the general elections of 1977 and a new constitution of 1978 that established the country as a constitutional monarchy with a bicameral parliament. The most important political figure is the prime minister, who leads the government, while the head of state is the Monarch (currently King Felipe VI), who has a ceremonial and symbolic role. Spain’s political landscape has radically changed in the last decade, with the traditional left-right swings since the 1980s between the socialists (PSOE) and conservatives (PP) upended. Instead, it has turned into a 4-party system following the 2016 national elections, when the left-wing Podemos and liberal Ciudadanos entered the Parliament. While Podemos has been a result of the enduring economic malaise which prompted the Socialists to start implementing austerity policies, Ciudadanos gained political prominence due to its firm stance on Catalan independence – its initial raison d’être – and the failing leadership of Mariano Rajoy, whose conservative PP party was tainted by several corruption cases. Meanwhile, another offspring of the Catalan issue is the far-right party Vox, which entered the political scene as the likely fifth political force, following its breakthrough this year in regional parliament elections in Andalusia, where it helped propel a PP-Ciudadanos minority government into power. Spain is currently heading for snap general elections on 28th April. These were called by its minority government led by socialist (PSOE) Prime Minister Pedro Sanchez, after it lost the voting for the 2019 budget in February. 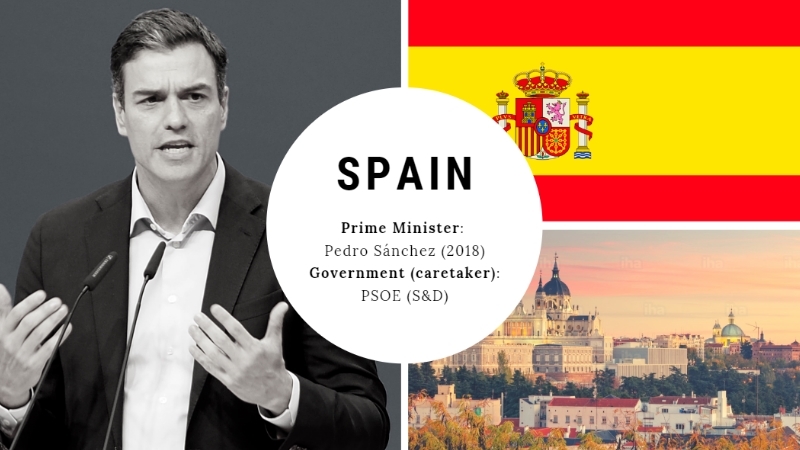 Sanchez reached power after a successful no-confidence motion ousted Rajoy’s conservative government in June 2018, with the support of Podemos and regionalist parties. Ever since, the government relied on them for support. However, nationalist political parties from Catalonia voted against the budget, after Sanchez refused to allow an independence referendum for Catalonia. Based on the most recent projections, Sanchez’s PSOE is expected to win around a quarter of the vote, meaning 16 seats (up two) for the Progressive Alliance of Socialists and Democrats (S&D), followed close by PP with 15 seats (down one) for the European People’s Party (EPP). Ciudadanos could win 12 for the Alliance of Liberals and Democrats for Europe (ALDE), after the integration of most of UPyD (a former liberal party), Unidos Podemos 9 for the European United Left/Nordic Green Left (GUE/NGL), and Vox 6, which is most likely to join a Eurosceptic group. Other regionalist parties present in 2014 could disappear, except for the left-wing Catalan nationalist ERC (Esquerra Republicana de Catalunya) that could get one MEP for the Greens–European Free Alliance (Greens/EFA). All in all, the two mainstream parties, PSOE and PP, could keep half of the total number MEPs. But the outcome of the 29 April national elections, following which a three-party ruling coalition might be necessary, could also influence the outcome of the EU election. Pablo Ribera Payá is a PhD candidate in European Studies at Masaryk University and works in EU policy analysis and communication. He holds a double degree master in European Governance. Robert Steenland works as an evaluation and research consultant in EU policies, as well as an analyst in EU politics. He holds a double degree master in European Governance.